Breaking down the silos of care, programs throughout the country bringing behavioral health into primary care are succeeding. What makes them work? Over the past several years, professionals from all corners of health care, including physicians, psychiatrists, nurses, and social workers, have recognized the need for integrated care. Integrated care—the coordination of general or primary health care with behavioral health care—is designed to address recognized gaps in the health care system. One such gap is the fact that behavioral health and physical health care have historically been addressed separately. "They kind of operate in silos," explains Barry Sarvet, MD, statewide medical director of Massachusetts Child Psychiatry Access Program (MCPAP) and chair of the department of psychiatry at University of Massachusetts Medical School-Baystate. In the mental health system, he says, there are barriers to access that don't exist in the physical health system. When patients are unable to locate and engage in mental health care services, they are more likely to express their behavioral health needs to their general practitioner. "The trend we were seeing and continue to see is that patients in primary care present to their primary care doctor reporting complex psychosocial issues, including substance use, major mental illness, homelessness, trauma, and protective concerns," says Buffy Sheff, MSW, LICSW, social work manager, ambulatory, specialties and inpatient oncology at Brigham and Women's Hospital in Boston. "These patients typically are high utilizers of emergency departments and have frequent admissions to inpatient psychiatric hospitals and medical units." Those struggling with moderate to mild mental health symptoms often fall through the cracks when these silos exist, leading to untreated behavioral health care conditions. Fortunately, as aforementioned, programs, organizations, and counties and states throughout the country have not only taken note of the existing gaps in services but also taken steps to eliminate them. They have done so by implementing integrated care models. 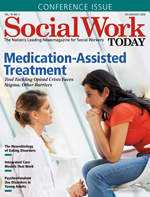 To better understand what those models look like in action, Social Work Today speaks with individuals from five entities in the United States about how they are working to bring behavioral and physical health care services together. In Massachusetts, a focus on integrated care began with the needs of children. "For at least five years prior to when MCPAP was launched in 2004, there was a coalition of pediatricians, child psychiatrists, psychologists, social workers, policy makers, [representatives from] insurance companies, and parent advocates meeting on a monthly basis to talk about access to care for kids' mental health," Sarvet says. With significant support from the Massachusetts chapter of the American Pediatric Association, the coalition of advocates was able to develop MCPAP. The program was adapted by the state's department of mental health and the Massachusetts Behavioral Health Partnership for statewide implementation prior to its launch in 2004. In MCPAP, the pediatrician remains the frontline provider, meeting with the children and their families and providing the initial assessments. When a behavioral health concern is presented or observed, the pediatrician consults with a MCPAP team via telephone to determine next steps. "[The teams] are made up of child psychiatrists, some LICSWs, and care coordinators, and the teams are configured throughout the state," Sarvet explains. While there were initially six teams in Massachusetts, there are now three with seven sites. "Each of these three teams operates a hotline for pediatricians. They call whenever they have any kind of need or they need some kind of help," he continues. "The majority are questions about 'What should I do?' Sometimes, the question is 'I need to find services for this child because I know they need therapy or to be in a hospital or in a program.'" When resources are sought, the care coordinator helps the pediatrician locate available services. For diagnostic questions, the psychiatrist or social worker is consulted. If possible, the psychiatrist can answer the pediatrician's questions and help guide them to the appropriate next steps. However, it is not uncommon for the doctor's questions to lead to an in-person evaluation. Sarvet notes that when an evaluation is determined to be necessary, the children are able to access an expedited psychiatric evaluation through the MCPAP team. A significant part of the program is training all involved professionals. The pediatricians have access to monthly webinars, online screening instruments, and tool kits, as well as the telephone consultations themselves. "We consider the telephone consultation to be a form of training," Sarvet says. "It's very informative to the pediatricians. When you go to medical school, you learn about the theory, but until you start seeing patients, it doesn't sink in that well." The team behind MCPAP has also developed clinical practice guidelines around common children's mental health conditions and plans to make them available to both the pediatricians and consulted clinicians. Since its implementation, MCPAP has become a national model, employed by programs in a majority of states. Similar to MCPAP is the Collaborative Care Model, which came out of the University of Washington. One example of the Collaborative Care Model was executed through Tailored Mental Health Management Support for Primary Care (TaMMS), a program that focused specifically on Washtenaw County, MI, but, since its end, professionals have been working to spread the Collaborative Care Model throughout the state. The model begins, like MCPAP, with primary care providers. Unlike MCPAP, the bulk of the Collaborative Care evidence has been around adult patients. However, evidence is growing in its use with adolescents. When employed with TaMMS, the focus was adults. To offer the integrated services, the care team in each practice expands by two. "There are two new care team members added—a behavioral health care manager and a psychiatric consultant," explains Sara Marasco, LMSW, collaborative care training and implementation specialist with the Michigan Medicine department of psychiatry. "The care manager and the psychiatric consultant meet on a regular basis to review a patient registry that captures the care manager's entire caseload of patients. The patient population is typically focused on patients with mild to moderate behavioral health conditions, such as depression and anxiety. "The psychiatric consultant usually doesn't meet with patients in person; rather, they listen to the care manager's case presentations during their weekly clinical meetings. The model is efficient in that it leverages scarce psychiatric time; the care manager and psychiatric consultant are usually able to review around six to eight patients per hour, as opposed to a typical 60- to 90-minute face-to-face psychiatric appointment," Marasco says. She adds, "They then enter treatment recommendations into the medical chart and send them to the primary care provider, who can review them and decide if they want to implement [the recommendations]." Marasco describes it as a population health management approach. "A lot of the programs utilize embedded providers in more traditional mental health models. This model uses a patient registry that's developed specifically for collaborative care. It ensures that patients are being contacted on a scheduled basis and no one is falling through the cracks." As a part of the team, the care managers are the ones who provide that contact. They are able to meet with the patients and follow up in between primary care appointments to ensure that recommendations are being followed. The care managers conduct assessments, take psychiatric histories, discuss medications, and deliver evidence-based brief interventions, among other duties. Marasco says that the follow-up care managers are able to provide is one of the keys to the program's success. "Having a care manager reach out to them [a patient] after they start a medication or try a new technique—they appreciate being able to receive that care all within their medical home," she says. Additionally, the doctors appreciate the access to psychiatric consultants. Though they often trust the expertise and role of the care manager, the practitioners have the option of contacting the psychiatric consultant directly with any questions about recommendations. At Brigham and Women's Hospital, the Collaborative Care Model is also employed. However, it is not the only integrated care model used by the health system. Brigham and Women's has also implemented the Integrated Care Management Program (iCMP). "The Integrated Care Management Program was developed as a federally sponsored demonstration project that started in 2006," says Christine Duchesneau, RN, BSN, CCM, iCMP nurse at Brigham and Women's Hospital. "It was designed for high-risk, chronically ill patients with multiple medical conditions. These patients were recognized as patients who needed the most help coordinating their care and had the most difficulty navigating through the system." By employing both models, Brigham and Women's is able to provide integrated care in the office as well as the community, and to address the needs of individuals with mild/moderate mental health conditions, as well as the needs of patients with more complex concerns. The Collaborative Care Model places a behavioral health care worker in the primary care office. "Social workers in this model are fully embedded in the primary care settings and work side by side with the medical team to address barriers to improving patient health," Sheff says. "Our interdisciplinary approach prioritizes all aspects of improving patient health outcomes, from tracking depression and anxiety through routine behavioral health scales to sleep hygiene to interpersonal violence." The iCMP takes integrated care to a community level, bringing community health workers, community resource specialists, palliative care specialists, and geriatric specialists to the table as well. "In the iCMP, an RN care coordinator manages a panel of approximately 180 patients who are identified as high emergency department utilizers, had multiple hospital admissions, or are taking many medications. iCMP is designed to reduce avoidable costs and decrease hospital admissions," Duchesneau explains. As a result of these programs, Brigham and Women's has seen patient engagement and health outcomes improve while emergency department use has decreased. While the above models focused on integrated services through the primary care office, other models start with the mental health provider. In Missouri, these integrated services are supported by the Missouri (MO) Coalition for Community Behavioral Healthcare. The coalition itself represents the state's community mental health centers (CMHCs). "The CMHCs in Missouri are contracted with the state, and they are assigned service areas. They serve the mental health needs of all the people within that service area," says Kim Yeagle, LCSW, integrated health manager at MO Coalition for Community Behavioral Healthcare. "They [CMHCs] are the gateway for folks to get into services." However, that gateway initially extended only to mental health care. Individuals needed to access their physical health care at other agencies. While this remains true—CMHCs do not offer physical health services—the goal of the coalition and the state was to bridge the gap between the two. To do so, Missouri implemented health care homes in its CMHCs. Health care homes are available to individuals with a serious mental illness, a mental health condition, and a substance use disorder, or a mental health condition and a chronic physical health condition. The final qualifier is where integrated care comes into play. Again, the CMHCs and health care homes do not take the place of a primary care provider or physical health specialist. Rather, "We are the care coordinators," Yeagle explains. "We help clients understand their illnesses. [Eligible patients] have case managers that work with them in the community and build a relationship so they can facilitate the self-management of these diseases." "The key," Yeagle continues, "is the relationship. You cannot manage folks with a chronic mental illness over the phone, and you can't manage them by having them come into your office every so often. The data shows they don't come. [What works is having] someone who can walk alongside the client and help them figure out, 'What does the change I need to make look like in my life?'" To effectively foster these relationships, primary care nurses were added to behavioral health care teams. This provides social workers and other behavioral health care providers a colleague who can help educate them on various health conditions so that the behavioral health providers can in turn help inform their clients. As with MCPAP, what helps to make this integrated care model successful is training "We provide a whole host of trainings," Yeagle says. She lists a variety of topics from trauma to motivational interviewing to mindfulness, all of which serve to prepare behavioral health teams for working with their patients. "It's training the staff in our agencies on how to support people in self-management in their conditions. It's all behavior change and self-management," she says. On a broader level is the Center of Excellence for Integrated Care, a program of the Foundation of Health Leadership & Innovation. The center promotes adopting an integrated care model unique to each practice in North Carolina. Rather than working specifically with primary care or mental health care providers, the center looks to help provide integrated services in all health modalities. This could mean working to bring behavioral health professionals into general practitioners' offices, nurse practitioners into mental health clinics, or even providers into churches whose parishioners have identified mental health or substance use disorder needs. The center started as a grassroots program designed to look holistically at people's health care. It works to determine how providers can best offer integrated care by offering direct training and guidance, as well as advocacy at a policy level. Monica Williams Harrison, MSW, LCSW, associate director of the Center of Excellence for Integrated Care, explains that she does work a great deal with primary care providers. "Doctors typically will find out what is going on with patients that is impacting them emotionally," she says. "If there are trained behavioral health clinicians in the practices who are comfortable working with the population and you train individuals to deal with the mild/moderate [conditions], you free the [mental health care] system up." However, primary care providers are not the only ones interested in integrated care. The center has also worked with specialists to determine how best to introduce behavioral health care providers into their offices. These specialists range from infectious disease to dental health care. Because the center works with all types of providers, one of the first steps taken toward integrated care is determining where an office is on the integrated care continuum. "SAMHSA has a framework for the six levels of integration. We start with that. Integrated care can look very different depending on what part of the state you're in, the buy-in from administration, the staff. We assess where they are and where they'd like to be. "In the past, North Carolina was very much 'it looks just like this,' but we don't come in telling them, 'You're doing it right' or 'You're doing it wrong.' It doesn't look one way. It is on a continuum," she says. Depending on where the practice is on said continuum, the center offers the necessary assistance to begin or improve integrated care services. In each of these models or programs are social workers. Their roles vary depending on need, education, and experience, but they are crucial to the success of integrated care services. For example, during the TaMMS initiative, a concerted effort was made to only hire social workers to fill the care manager positions. "We intentionally hired MSWs," Marasco says. "There are definitely strengths in hiring either an MSW or an RN. But, we've noticed that MSWs tend to have specialized clinical training in brief behavioral interventions that are so helpful for the treatment of behavioral health conditions." Similarly, when the health care homes began in Missouri, most care team directors were RNs. However, over time, that has changed, and increasingly social workers are being hired to fill those roles. What this means is that as integrated care models such as those described above become increasingly prevalent and vital to the successful delivery of health care in the United States, so do social workers.